As America bolts toward a more multiracial future in the face of skyrocketing inequality, local leaders are desperately seeking strategies to foster more inclusive growth. Chris Benner and Manuel Pastor’s research uncovers a critical ingredient of success: diverse regional leaders coming together to build a foundation of shared knowledge and advance positive change. This book, the latest fruit of a highly productive collaboration between two first-rate thinkers, is both immensely wise and highly practical—a must-read. Benner and Pastor blow apart simplistic ideas about collaborative problem-solving—which tend to stop at reframing or the magic of dialogue—to show how the locally driven process of generating shared knowledge, risk-taking and even productive conflict can generate real progress on the most urgent challenges our country and our communities face. Get the eBook or Read Online Now! Chris Benner and Manuel Pastor’s new book Equity, Growth, and Community, What the Nation Can Learn from America’s Metro Areas examines how inequality stunts economic growth and how bringing together equity and growth requires concerted local action. 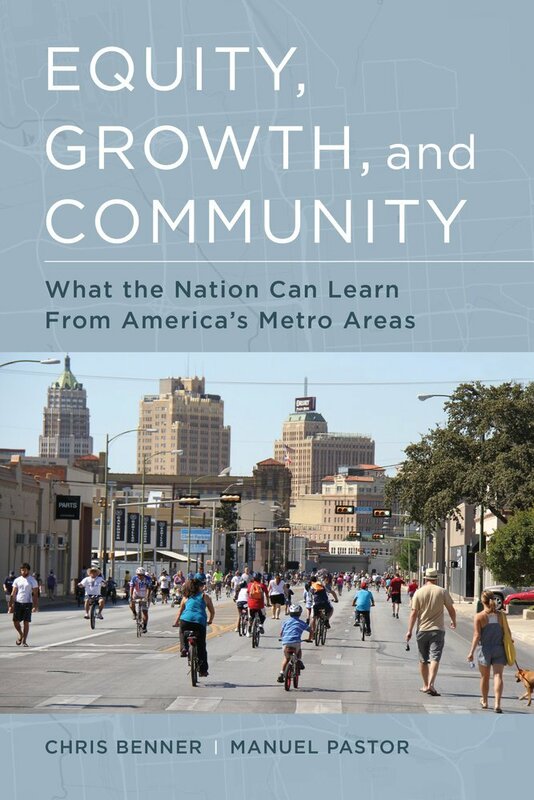 Combining data, case studies, and emerging narratives on multi-sector collaborations in 11 metro regions, the book offers a powerful prescription not just for metros, but for our national challenges of slow job growth, rising economic inequality, and sharp political polarization. Ranging in approaches from planner-led and business-led, to conflict-driven and high tech/high road-centered, the case studies offer instructive models for other metro regions. Benner and Pastor’s research also goes beyond the “Blue vs Red”, finding as much merit in places like Salt Lake City and Seattle, as in Oklahoma City and San Antonio. While they acknowledge that conflict is often necessary to build power and shift policy, the crux of their argument is simple: knowing together is a precursor to growing together. Lifting up lessons from places where equity, growth, and community have come together, the book can help inform a new national conversation about how to secure prosperity, promote inclusion, and reweave a tattered social fabric. Why have a free ebook version? Probably like many academic authors, we were initially concerned that open access might be viewed by others as meaning low quality – after all, if it was really good, why would it be “free”? However, we were reassured otherwise by, first, our own standards of rigor but also by the reviews from which this manuscript benefited and the exacting process that UC Press and Luminos have put in place to insure a high quality series. Once we were past that, we realized that we have long valued our role as public intellectuals who are willing and indeed, eager, to bring ideas into the messy real world and participate in the debates that change lives – and this model is perfectly suited to that sort of effort. Moreover, the central messages of our book – that equity and opportunity are key for sustainable growth, that cross-sector conversations can bring new common ground, and that data deliberations in knowledge communities can forge productive solutions – are all really reflected in the open-access model UC Press and Luminos are helping to pioneer. It’s a perfect fit for us and we’re proud to be part of this effort to democratize access to scholarship of consequence.